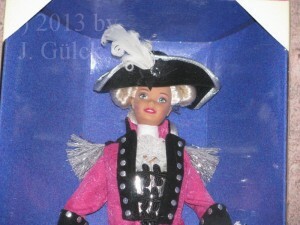 Barbie as George Washington is for me one of the craziest Barbie dolls ever created. 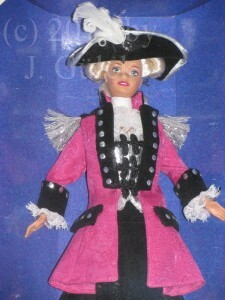 Originally she was made as exclusive doll for the US Toy Chain FAO Schwarz and sold there in 1997. I don’t know the exact retail price but I estimate that she was not cheap. Anyways, I always liked this crazy doll and I bought her several months ago. She’s inspired by the 18th century fashion and style. I like especially the pink coat and the black hat of a military uniform. 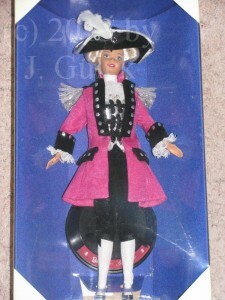 To mention here is also that she is the only Barbie doll to wear knee breeches and I know a lot of Barbie dolls.